(EXCLUSIVE) Is Fyve Derbyshire Condo near Novena MRT a Good Buy? A cutting edge condo and one of the newest available for sale in the posh Novena region. If you are on the lookout of a luxury condo in Novena which is sure to provide you with a seemingly high-end living experience with quick access to the best of the amenities and facilities, Fyve Derbyshire might just be the ideal property you are looking for. Known as the former 20-unit Derby Court, the freehold site was acquired by RH Development Two Pte Ltd, a subsidiary firm of the local renowned developer, Roxy Pacific Holdings back in December 2017 for $73.88 million ($1,390 psf ppr) via a collective sale. Whenever we mention about living in Novena, many would instantly associate the area with tons of high-end private residential developments and a wide range of reputable schools which parents would love to get their kids into. Hence, it doesn’t really require much introduction to understand why Novena is very well-known as one of the prime residential districts in Singapore for decades (at least for 30 years). So, let’s take a look at what Fyve Derbyshire has to offer and if it is going to be the name which most real estate investors are having eyes on. Here’s our exclusive write-up and our views on whether Fyve Derbyshire condo near Novena MRT a good buy. There are always uncertainties when buying the condominium or apartment which hasn’t been constructed, such as the finishes, fittings and build quality of the development. Therefore, when it comes to buying a new launch condo, we feel that it’s important to look at who is the developer for the project and its track record in order give yourself more assurance of the final product. The Fyve Derbyshire condo is being developed by RH Development Two Pte Ltd. which is a subsidiary company of Roxy Pacific Holdings. It is important to mention here that Roxy Pacific Holdings is, in fact, one of the world’s most well-known property and hospitality groups who have been in the business since as far back as the late 1960s. It is also the developer and owner of various boutique hotels in Kyoto and Osaka in Japan. Apart from this, the group has also bought a resort in the Maldives and is also developing hotels in Phuket. Roxy Pacific Holdings has established its name as one of the best developers for developing small to medium-sized residential apartments and condominiums which are specifically geared for the middle and upper-middle class section of the society. Although Roxy Pacific Holdings has projects in several different countries, its focus is limited to the Asia Pacific region in countries like Singapore, Malaysia, and Australia. It is important to mention here that the group launched around 44 small to medium-sized developments consisting of more than 4,000 commercial and residential units between 2004 and 2017 in Australia, Malaysia, and Singapore. Some of Roxy Pacific’s most recent residential projects completed in Singapore include Trilive (at Kovan), EON Shenton (in the Central Business District), Sunnyvale Residences (at Telok Kurau), and LIV on Wilkie (at Mount Sophia area). 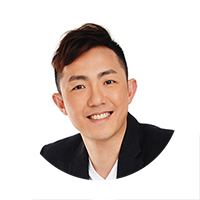 Other than being the developer of Fyve Derbyshire, they are also in the midst of marketing other residential developments such as RV Altitude (at River Valley), Arena Residences (along Guillemard Road) and Bukit 828 (at Bukit Timah). The Fyve Derbyshire condo enjoys one of the best locations that you could wish for in a residential project. Located at 5 Derbyshire Road, Singapore 309461, this property is situated at an ideal spot if you want to live peacefully, away from the city’s hustle bustle. It is strategically placed in the Core Central Region (CCR) of Singapore within Derbyshire Road enclave – adjacent to Derbyshire Heights, opposite to Adria and 6 Derbyshire (the latest condo to be completed in the area). This amazing location not only translates to high-class living but also means easy connectivity and accessibility. Speaking of which, residents of Fyve Derbyshire can easily commute to and from work every day via car or train. The condo is located at just a 5-minute walk from the nearest Novena MRT train station exit. What’s more, Central Expressway is pretty close by as well. If you are traveling by your own vehicle, it will take you just 3 minutes to reach the Central Expressway or the CTE that will connect you with other highways and take you right into the heart of Singapore’s business district. If you prefer traveling by public buses, there is a wide range of public bus services along Thomson Road which can take you to various parts across Singapore. For instance, there is a direct bus which takes you to the Central Business District (CBD) in approximately 30 minutes. That said, the site is close to all major F&B outlets, entertainment hubs, educational centers, and healthcare institutes. It is definitely a plus point, especially when you plan to invest in the property from a high-end living point of view. Shopping, dining, supermarkets, and banks have formed an essential part of living in Singapore over the last decade. Thankfully enough, living at Fyve Derbyshire condo not only enable you to enjoy the ease of accessibility, but it is also located near to good-sized malls and fine dining restaurants. Novena Square, United Square, and Velocity @ Novena are the most prominent malls that are located within a stone’s throw from Fyve Derbyshire. In fact, the United Square mall is located just 400 meters away from the site and is a great place to spend some time – all thanks to the range of cafes, fast food outlets, salons, food court and shops that are in the mall. On top of that, it also houses some of the most well-known enrichments centers for kids. Moreover, if you venture out just a little bit further, you can reach the world famous Orchard Road shopping belt within no time at all. For groceries, you can head down to the Cold Storage supermarket at United Square mall or Novena Square which are just around 500 to 600 meters away from Fyve Derbyshire condo. There is also a Fairprice supermarket at Novena Square 2 which is just slightly further ahead. If you are looking for some local cuisines, the amazing locality of Fyve Derbyshire wouldn’t disappoint you at all. All you need to do is head on to Balestier Road, which is within walking distance from the Novena condo. It has some great options for fine dining restaurants. In here, you can satiate your taste buds with various Singaporean dishes like Rojak, Duck Rice, and Bak Kut Teh. Some other dining options which are at a walkable distance from the condo include the Whampoa Drive Food Centre, Pek Kio Market, and Food Centre and the Newton Food Centre. You can also drive down to the Tekka Market and Albert Centre Market & Food Centre for some local culinary delights that will keep you coming back for more. Nevertheless, when it comes to living, it is necessary to ensure that the property is situated close to the best schools and colleges. Thankfully, Fyve Derbyshire doesn’t disappoint in this aspect as well. Right from preschools to primary, secondary and even junior colleges, there are a number of schools in the Novena district which children of any age group can attend. Some of the schools that are located closely to the Fyve Derbyshire condo include Saint Joseph’s Institution (Junior), Anglo Chinese Junior School, Anglo Chinese Primary School, Anglo Chinese School (Barker Road), Balestier Hill Primary School, Balestier Hill Secondary School, Bendemeer Secondary School, Catholic Junior College, CHIJ Primary School, CHIK Secondary School, Hong Wen School, Saint Margaret’s Primary School, School of the Arts (SOTA), and Stamford Primary School. Apart from the above local schools, the Novena District is also home to several international schools including the likes of Chinese International School, Etonhouse Pre School (Newton), Etonhouse Pre School (Claymore), Global Indian International School (Balestier Campus), and Swedish Supplementary Education School. Healthcare is not compromised too – and in fact, it is one of the biggest of the Novena precinct. Fyve Derbyshire Condo is located really close to the Novena Health City which is one of the biggest medical hubs of Singapore under the National Healthcare Group. It is also where the upscale Mount Elizabeth Novena is located and is a beacon for 24 hours public as well as volunteer health care facilities. Although most of your medical needs will be taken care of at the Novena Medical Hub, you also have the option of visiting Novena Medical Centre if you want to consult the top doctors of Singapore from a wide range of medical fields. Adding to this, the Royal Square @ Novena – a commercial with shops, restaurants, medical suites and hotel (run by Courtyard Singapore Novena) also stands at close proximity to Fyve Derbyshire condo. Two of the longest standing hospitals in the area are KK Women’s and Children’s Hospital together with Tan Tock Seng Hospital, which are known for providing the best immediate and long term medical care during the last few decades in Singapore. Here is a quick overview of Fyve Derbyshire fact sheet. Needless to say, one of the many perks of Fyve Derbyshire is the complete package of amenities and facilities that it has on offer despite a relatively small development. From a well-maintained swimming pool to a wellness garden, Fyve Derbyshire has everything you can think of. Most importantly, every unit at Fyve Derbyshire has been meticulously designed to provide an unbeatable comfort to every household type. All units will be equipped with painstakingly chosen appliances and the modern-day outfitting and it will definitely provide you with a sumptuous shelter for a start. 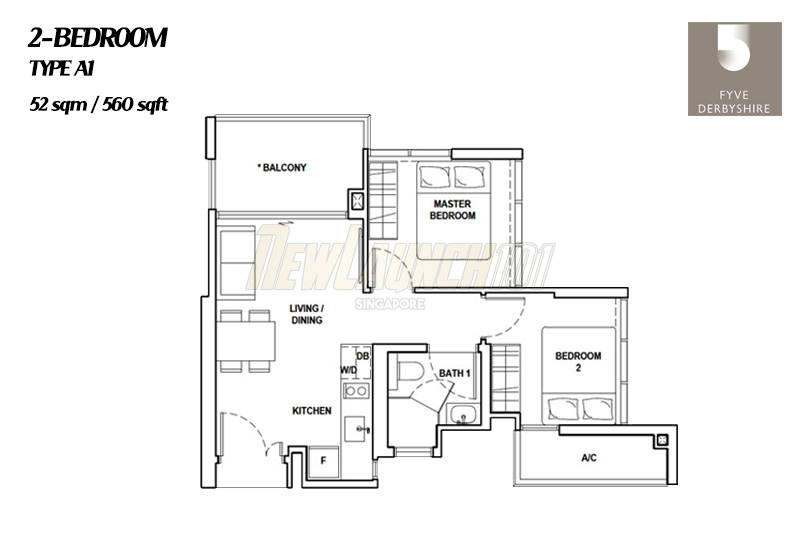 Each of these units exhibits a roomy layout which promotes good vibes and is spacious enough. All the units in Fyve Derbyshire are North-South oriented in the living area. This not only maximizes the brightness in each of the apartments but also ensures appreciable air flow. The living rooms are provided with high ceilings, and bedrooms showcase natural illumination, fancy closets and drawers, and an overall, well-planned ambiance. However, that will also mean some of the bedrooms (depending on which unit type) will be facing west from the window. Therefore it may get a little hot as the sun sets. The Fyve Derbyshire condo comprises of a single building. It has 19 floors with 71 residential units. 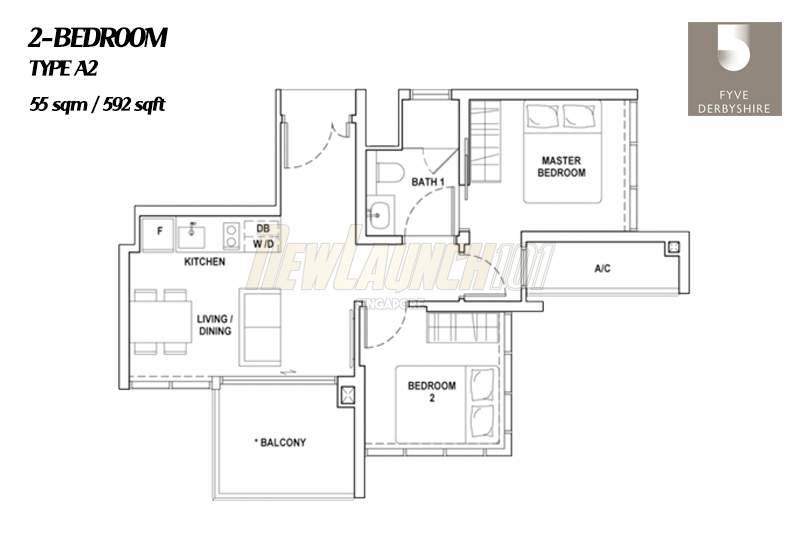 There are 5 types of floor plans with a total site area is of 18,506 square feet. Let’s have a quick look at the Fyve Derbyshire floor plans and the unit types available for sale. 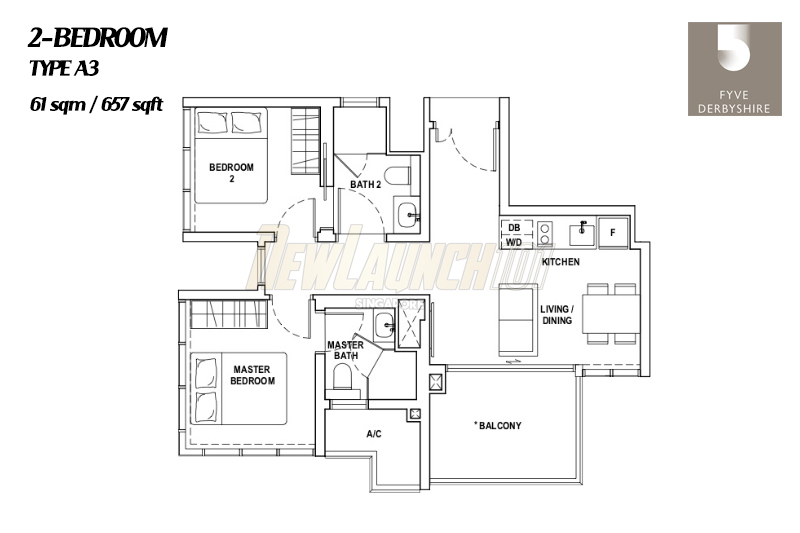 Type C consists of 3 bedrooms along with a guest room. Similar to Type B, it also has 17 units, and each unit covers an area of 87 sqm / 936 sqft. The Fyve Derbyshire showflat is located opposite Soleil @ Sinaran condo and it is just next to Tan Tock Seng Hospital and Apleton View apartment – along Sinaran Drive. In fact, it’s situated on the site which has been earmarked to be the development of this new freehold condo at Novena called Moulmein27 (which will be developed by Roxy-Pacific as well). For viewing appointments, please contact (+65) 6631-8384 or just drop us a note using the form below. The following is a price guide for Fyve Derbyshire. Please note that these are just indicative pricing as of 15 February 2019, therefore do give us a call at (+65) 6631-8384 to check on the latest Fyve Derbyshire price. 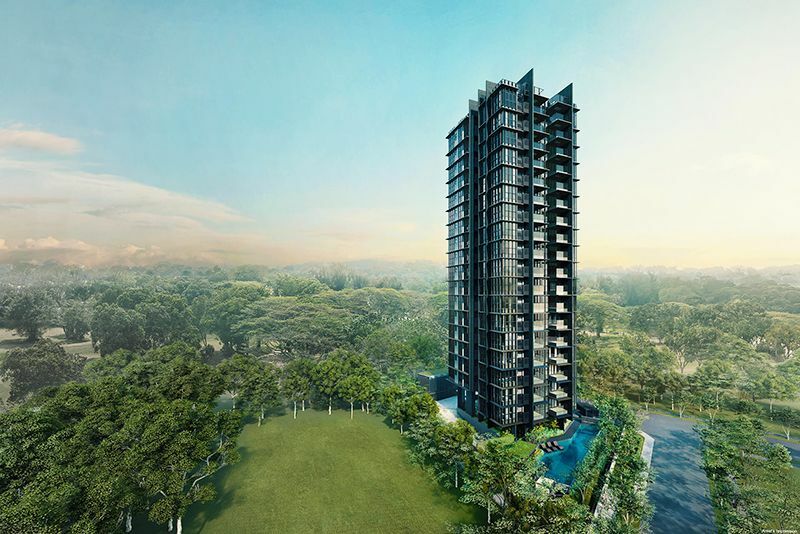 Let’s admit: Fyve Derbyshire is possibly one of the better developments available in Singapore’s private residential market at the time when we post this write-up. It is no doubt that this condo will provide you with a taste of high-class peaceful living along with easy accessibility, quick connectivity, and luxurious amenities and on-the-go healthcare and education. Fyve Derbyshire is, honestly, the perfect amalgamation of uber modern living, stylish interiors, and practical approach. We really love the layout of the units at Fyve Derbyshire as there is hardly any wastage of space. Each unit is efficiently designed to reflect the urban lifestyle and merged seamlessly with the overall affluent features of the condo. This Novena condo definitely comes with a lot of unique advantages. Even if you do not plan to live here yourself but want to rent it out, you are likely to find tenants with good profiles – even for the smallest unit in this project. However, our key concern is that the rental yield may be a little worrying for investors. We are going to compare with the newest neighboring condo at Derbyshire Road. So, let’s take a look at 6 Derbyshire rental transactions over the last 6 months. To summarize the rental transactions, you can have a look at the table below. Assuming you purchased the lowest priced 2-bedroom (560 sqft) unit at Fyve Derbyshire for $1.384 million and you are actually able to achieve a rental of $3,000 per month. Your projected annual rental yield will be a mere 2.6 percent (12 months of rent divide by the overall purchase price). Please note that it is only if you are ‘lucky‘ enough because, at $3,000 per month, the prospective tenant can get a much bigger 2-bedroom unit at 6 Derbyshire. Therefore, in our opinion, anything below a minimum of 3 percent rental yield doesn’t really make much investment sense. Any fix deposits, investing REITs or ‘blue chips’ in Singapore would be able to give you the same yield or even higher. That said, it is not that Fyve Derbyshire would not make a good property. It’s probably more suitable for anyone who loves living in the Novena precinct and use this property for their own consumption. As an investment tool, it isn’t really the smartest option for high ROI potential. Layouts are high efficient. Hardly any wastage. I would like to view Fyve Derbyshire and receive priority information on this project. Thanks.